Right now I have some AWESOME board shorts I can’t wear. I’m gonna get back into them. Every other week, Jerad – a pacemaker technician, husband, and father of three – drives 2+ hours from his home in Ripon, CA to Naked Labs®’ HQ to participate in our Beta Program. Jerad, 44, lived much of his young life on a sailboat, where he saw a great deal of the world, developed a love for the water, and became addicted to any sport that comes along with a giant adrenaline kick. Years later, when Jerad suffered a major neck injury in a snowboarding accident, he found himself slipping out of shape. 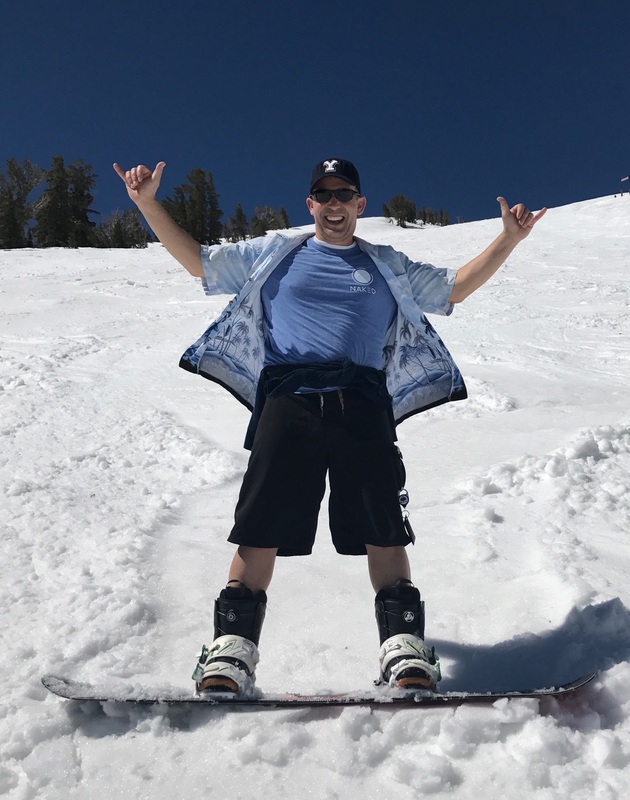 Despite all his injuries, Jerad still loves thrill seeking and couldn't pass up a chance to hit the slopes with his family this Spring. After the accident, Jerad eventually started cycling and rode his way out of his fitness rut. But after another neck injury, this time while attempting a backflip on a wakeboard (have we mentioned this man is an adrenaline junkie? ), Jerad fell out of shape once again. Now, Jerad is getting back on track and has been making amazing progress! Like many of us, Jerad constantly struggles to maintain a healthy and active lifestyle when faced with a grueling work schedule (and a serious addiction to Doritos). Thus far, Jerad's competitive spirit and determination to stay active have continued to propel him toward his goals. I get in shape and I lose it, I get in shape and I lose it. I’m either 100% on or 120% off. Naked helps me get rid of the swings and be responsive to the type of behavior I want to exhibit in the first place. Progress has been great – but it’s been very slow, very steady and very constant. How has Jerad shaped Naked? Like all of our beta testers, Jerad brings a unique and indispensable outside perspective to our product. Jerad kindly allows us to poke, prod, and measure every inch of his body on a bi-weekly basis so that we can test the validity and reliability of our scans. He also provides critical feedback on everything ranging from hardware and UX/UI to branding. Jerad and our other beta testers provide insight from the customer perspective. Their participation is critical to ensuring that Naked delivers a product that addresses our users’ wants and needs. Why does Jerad think Naked is important? Since Jerad began beta testing, he’s abandoned his crash diets and found himself making sustainable, incremental changes. With Naked's body models, he’s able to visualize his body’s changes before he drops a full pant size or sees a totally different body in the mirror. This past month in particular, Jerad has reached a point in his fitness journey where he no longer sees much movement in his weight. Before Naked, this might be the time when Jerad would abandon a diet or fitness regimen, wondering, "What's the point was of killing myself if I'm not making any progress?" Now, he is seeing that his composition and musculature can still undergo changes even when the number on the scale doesn't. This last month is a perfect example of why this is a product that will change the way we look at our bodies. Jerad's time at Naked is helping him to shift his focus away from weight alone and toward what’s really important – making healthy and sustainable changes in his habits and tracking his body’s response through meaningful and observable data.